As the former Governor of Osun State, Ogbeni Rauf Aregbesola exits power as the executive governor of Osun State, the Peoples Democratic Party, PDP, in the state has called on the Inspector General of Police, Ibrahim Idris to resume charges of forgery and conspiracy against him. The party recalled that Aregbesola was facing charges bordering on forgery and presentation of fake police report to election petition tribunal in 2007. This was contained in a press statement signed by the Chairman of the party, Hon. Soji Adagunodo, in Osogbo on Wednesday. 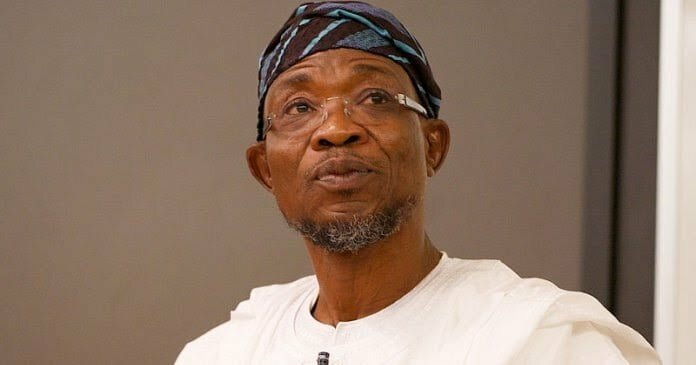 â€œIt should be recalled that Mr Aregbesola and one other person were facing a six count charge before an Abuja High court for forging and presenting a fake police report to an election petition tribunal in 2007 before assuming office as governor in 2010.
â€œNow that Mr Aregbesola no longer enjoys constitutional immunity, the Inspector General of Police is duty bound to arrest him and present him before the court to prove his innocence in the charge. â€œWhile forgery itself is a weighty crime, forging a security document like a police report should be a matter of concern to the public and must not be swept under the carpet in any guise. â€œSince time does not run against the state in criminal matters, the Attorney General of the Federation and the Inspector General of Police have no excuse whatsoever to abandon the case of forgery against the former governorâ€, the statement read. The party called on civil society organisations and concerned stakeholders to lend their voices to the call, adding that it was on the basis of the forged police report that the Appellate tribunal in Ibadan ordered a retrial of Aregbesolaâ€™s petition in 2009.